I did talk with Tech support the other day and she was telling me they are going to issue a whole new update for the app as they were having a lot of problems and had to start from scratch with a lot of things. I think they released this stuff too early. I really question the security of the whole app thing too? It really seems it just was not ready for prime time yet. i have been in touch with Mercedes Me Technical pretty much every day since November! I know they are updating a lot of the software and yesterday they did a shutdown for a period of time forvtechnical updates. Might just need time time for real-activationon some models. Keep trying! It is morning here and it is working fine but i do find it inaccessible quite often. For that reason i keep a link to the web portal on my phone. It is not as clear but does do the same functions well for me we do not have remote start here and i do not have the remote parking. I think Mercedes should have hired an outside App Developer to make these apps. They've never really had one that just works. Or at least works easily. I was able to login again this morning. The two features I use the most are lock my car remotely and send an address to my car. I do like getting a notification on my Apple Watch if somehow I forgot to lock my car. I wish I could lock it from the watch though. To lock it, I have to go to my iPhone and hold the lock button there. Since I have a Cellular Apple Watch, there are some situations, where I don't have my phone with me. For our friends in the Northeast, I hope the snow storm isn't too bad this weekend. It's going to sunny and 78 in Tampa, today! Last edited by rbrylaw; 01-21-2019 at 11:14 AM. Yeah, I also mainly use the app to send addresses to the car. In fact, I just did it now and it worked as expected. Last edited by Helmar; 01-21-2019 at 01:02 PM. Interesting. I created up a Pin Number and tried Remote Start for the first time yesterday. It worked fine. Maybe its functionality comes and goes? I'll try it some more as time permits. FYI, on iPhone there is an update today for the Mercedes Me Connect App. It just says bug fixes and performance improvements, but doesn't list anything specific it addresses. after speaking to a number of people they said it’s a known problem but no fix in sight! Maybe with the next update? 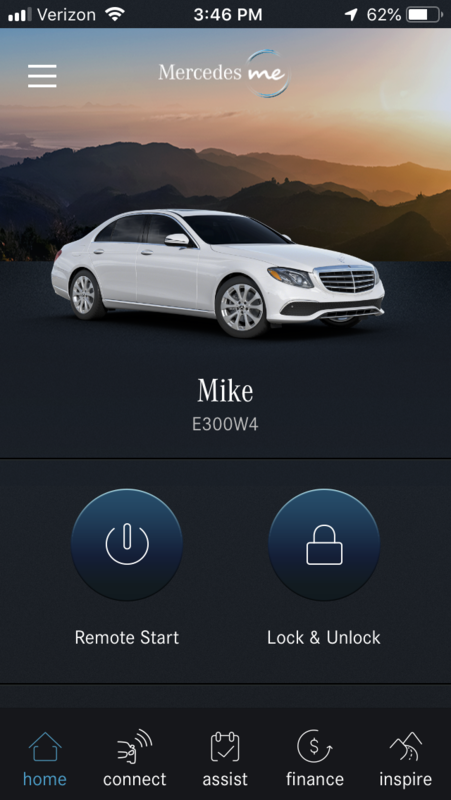 Not sure what to tell you, but we have an E400, which uses Mercedes Me and an E450, which uses Mercedes Me Connect. 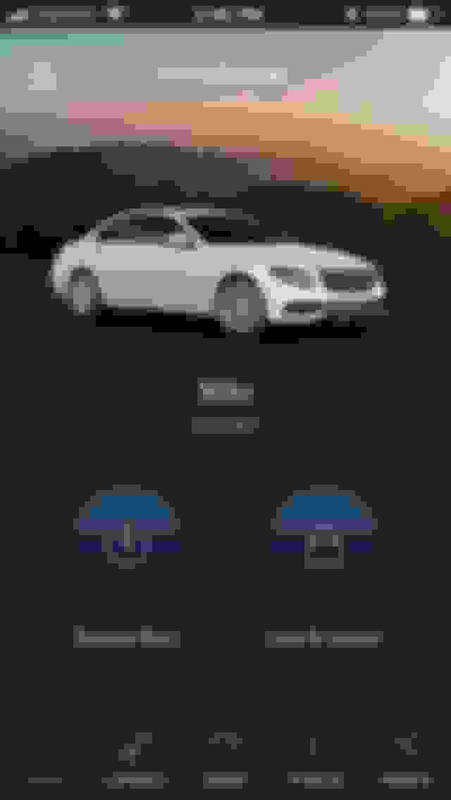 I just opened the Mercedes Me app on my iPhone, running iOS 12.1.3 and Send2Benz is there and working just fine. Maybe delete the App and then reinstall it. Thanks, done that, deleted the app and the cache, loaded on my wife’s phone all no luck! I don't understand at all how the feature can be missing from your app, but is clearly on my app and functioning on my app? I could see if it was on the app, but not working, but to not even be on the main screen isn't logical. Take a screen shot of the main page of the Mercedes Me app and post it, if you don't mind. Last edited by rbrylaw; 01-24-2019 at 03:45 PM. Thanks for heads up. App kept crashing all day when i tried to open it so i have uninstalled and reinstalled and its working fine now. do not have remote start but everything is working fine. See, not there! Amazing, right? I am using android on a samsung S9 maybe it is the apple iteration that is having probs. the app in the screenshot has a very different look to my european android look. Well that's just bizarre. The version on my iPhone as can be clearly seen, has the Send2Benz button. And it works. I have no clue why you don't have it. Do you have an active MBrace Account? I can understand why. Sending an address to either our E400 or E450 is the absolute most used function we have. When I got my E450 and couldn't get the Me Connect App to connect with my car, I called MBUSA daily and bugged them to death until they got some programmer, sitting in a basement in some remote city in Germany (literally) to figure out why my car wouldn't connect and get it connected. I'd recommend you call MBUSA and have them elevate this issue and complain until they resolve it. There's simply no reason on an iPhone using the very same app I use, you shouldn't have the Send2Benz button. Complain, Complain, Complain. Have them create a ticket number. Refer to that ticket number every time you call. Sad to say, but being a thorn in their side does get results. Still no luck on my e450 wagon getting it to remote start or unlock/lock doors. Works fine on the same app on my e450 Cabriolet, very strange. Got a complaint into mercedes, so far they are doing nothing. Had me take a couple screen shots of the app page where it's not working. It seems like it must be something within the car like the hermes module. I asked the rep I spoke with at mercedes connect if I should set up an appointment at the dealer, he said not yet. Strange because everything else on the wagon works within the app such as tire pressure readings and showing all other functions, it's just that I cannot get the car to do anything remotely. Tried everything I can think of, loading and unloading app, signing in and out, etc. Cannot control anything on the car from the computer portal either on that car, the Cabrio is fine. I should probably delete everything and try the app just using the wagon, maybe there is some kind of bug when using two cars on the app. Strange though because it worked fine for around a month, the last month it has been kaput. Last edited by 2012 merc amg; 01-24-2019 at 05:37 PM. Did you get a case number? Call them daily and complain. They need to elevate this to that one dude in a basement in some unnamed German City, who does the programming on the Me Connect App. Yes there is a claim number. I notice today the app is all screwed up. Taking forever to load and freezing up. Everything else with these cars is great other than this app. I had some fun in some curved roads yesterday in the wagon. It has a real nice solid feel to it in corners and is fun to drive in sport plus mode. I actually really like the sounds the twin turbo makes when revving in sport plus mode. Has some nice popping sounds to it too through the exhaust on decell. It’s kind of addicting.